One of our favorite recipes to warm us up during the Fall and Winter is Taco Soup, it’s delicious and super quick…15 minutes on the stovetop using only one pan makes for a quick meal and clean-up. Or if you like you can add all the ingredients to the Crockpot and let it simmer for a dinner ready when you are. With a little crumble of tortilla chips, shredded cheese and a spoonful of sour cream to top it off it makes the best tasting meal to chase away the chills. This recipe makes enough for a hearty dinner and lunch the next day. Cook Ground Beef and Onion, drain. While Beef is cooking, add all ingredients to the crockpot. After the Beef and Onion are drained, add them to the crockpot. Simmer on low for 4 hrs or on high for 2 hrs. Serve with crushed tortilla chips, shredded cheese and sour cream. Hey Hoosier Girl! I’m a Hoosier Girl too! If you get to South Bend around lunch time on Tuesday, there’s a restaurant on Mishawaka Ave. called Allies — that has an interesting version of Taco Soup (Usually they only offer it on Tuesdays). It’s like a cheese soup (Velveeta?) with taco toppings in it (perhaps it was created when someone had leftover taco fixings?) . In this cheese base soup there is cooked meat (seasoned hamburger, sausage, or taco meat? ), fresh tomatoes, bits of onion, and sliced black olives — but there’s heat in there too — not sure where that comes from — I don’t see any green chili peppers, or any hot peppers i n it. It’s pretty popular– there many customers that show up there on Tuesdays just for the Taco Soup. It’s a shame they don’t serve corn chips with it! Oh this makes me very hungry. 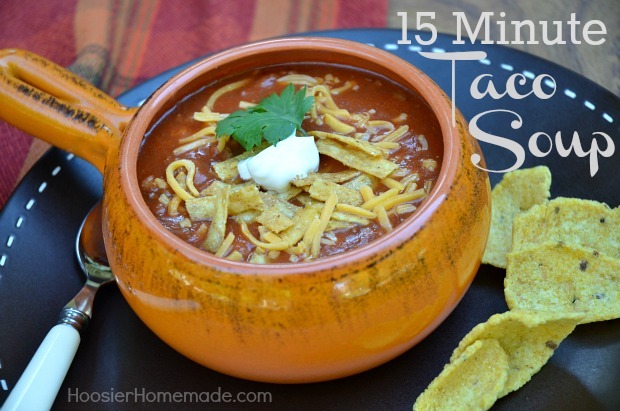 I love soup and this one sounds like a great combo- tacos and soup! Yum. Taco soup sounds awesome! hanks for sharing! 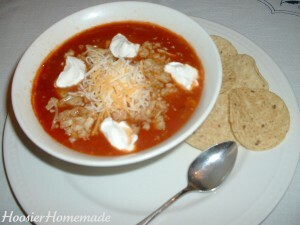 I like the Taco Soup recipe, it looks yummy and really easy to make. Thanks for sharing! That is a great idea Kim, I have never used V8 before. Thanks for sharing!